Keep your Class C motorhome looking like new. 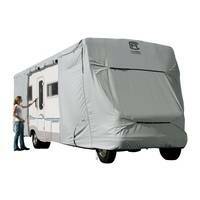 Using a Class C RV cover helps shield your motorhome from UV rays, snow, dirt and debris, when it's not in use. Choose from Classic and ADCO covers for your Class C motorhome in quality fabrics like Tyvek Wind, SFS AquaShed, and PermaPRO, for the best all-weather protection. Find your guaranteed fit cover below. 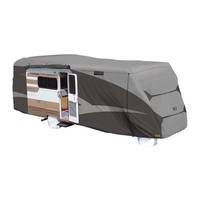 We also offer Tyre Gards and Windshield Covers for your Class C.
ADCO AquaShed Class C RV Cover and accessories presented by RVCoversDirect. AquaShed is our most economical material and, as the name suggests, is highly water repellent. Prices start at $251.29. The Aquashed will share many of the same features of the Tyvek Wind cover, but is designed mostly for wet climates. Zippered entry panels, cinching system, reinforcements, ladder cap, storage bag, elasticized hem and strap system are all standard as well. 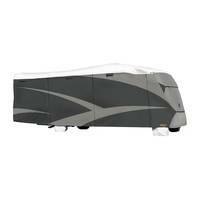 Shop ADCO SFS Aquashed by selecting your RV's length, width, and height. 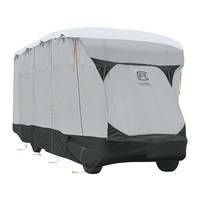 Classic PermaPRO Deluxe covers are a quality light weight cover designed to provide supreme protection. With easy installation and a lifetime warranty, this cover is a great choice. Comes with a limited lifetime warranty and storage bag. High grade tear resistant polyester with UV protection, water repellency and dent/ding protection. Snug fit with adjustable straps and vents to reduce moisture. Toss sack system for easy installation. Easy zippered entry access to camper while it is being stored, with long zipper pulls. Classic Skyshield covers are rated the best in classic coverage. Their high grade material give you the best coverage for all environments and is a breeze to install. Comes with a 4 year manufacturer’s warranty. Tyvek UV resistant top panel for maximum UV protection from the harsh sun rays. Easy installation with the use of the toss puck system and zippered entry while being stored. Comes with a repair kit and storage bag. At RV Covers Direct®, we stock only the finest quality materials from leading manufacturers like Classic Accessories and ADCO. Our covers are strong, durable, and built to last. Whether you have a Jayco, Fleetwood, Forest River, or Coachmen, we can cover and protect your Class C RV.